Stretching is an important part of physical and mental health that is often overlooked. 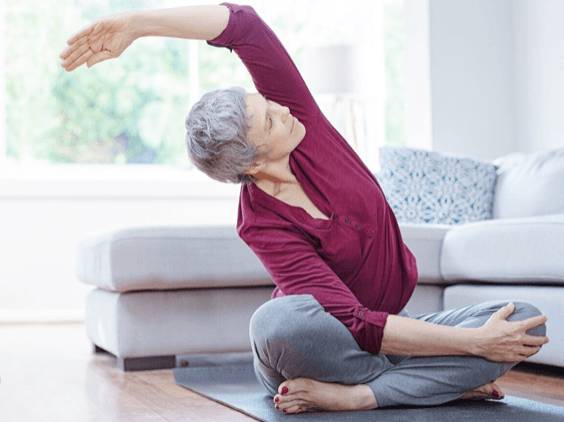 Whether you are an athlete, a newfound fitness enthusiast, or someone who doesn’t exercise at all, stretching is an activity that should be incorporated into your daily routine for better overall health. The best part is it doesn’t have to be time-consuming activity in order to work. Keep reading to find out the many benefits you can enjoy when you begin to stretch regularly! Increased performance: This is particularly important for those who already exercise because stretching can greatly reduce the chances of injury and improve overall performance by warming up the muscles, cooling them down, and aiding with recovery between workouts. Improved mobility: Even if you don’t exercise, stretching can help keep your muscles loose and pain-free as you age. Stress relief: Stretching can benefit mental and physical health by relieving tension, which often has a mental and physical connection. Exercises like yoga or simple stretch sessions at home which incorporate breathing techniques are proven to help ease symptoms of anxiety and depression. Better posture: Stretching can help your body by providing a better balance between the muscles. Again, by reducing tense and stiff areas, you are more likely to have better alignment and less discomfort. Increased blood flow: Stretching improves circulation and also helps to break down lactic acid that forms in the muscles after a training session. Stretching helps oxygen to flow back into the muscle to help break down the lactic acid, the process not only speeds up recovery but also helps reduce tension. Prevent pain: Stretching, as mentioned, helps reduce tension and stress. This results in less back pain, tension headaches, and other pain associated with tightness of the muscles. Stretching comes in many forms including yoga, dynamic stretching (best done before exercise), static stretching (best done following exercise), foam rolling, and more. Stretching has a number of physical and mental benefits for anyone. So what are you waiting for? All it takes is 5 to 10 minutes per day to start enjoying the benefits and lead a happier, healthier lifestyle.